A P-51 Mustang aircraft - WZ-S (serial number 44-72203), named "Sweet and Lovely", of the 78th Fighter Group, Duxford. The aircraft was piloted by Lieutenant Thomas V. Thain. 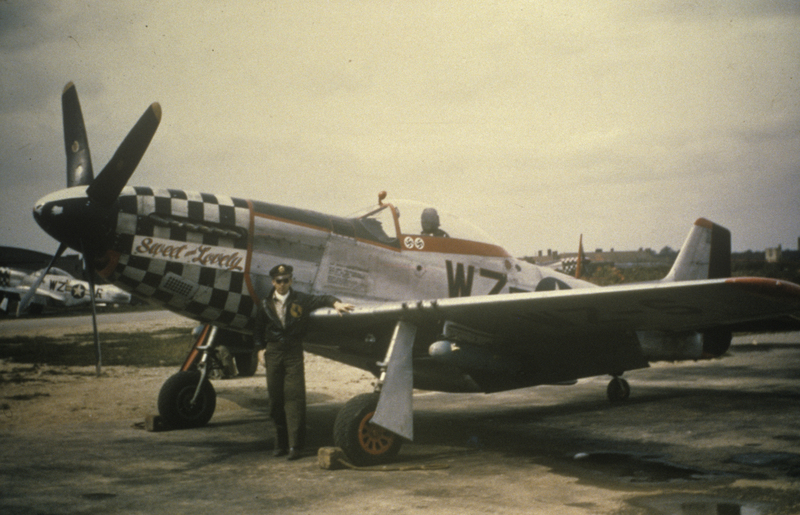 Handwritten on slide casing:"WZ-S Dx post VE Thomas V Thain"
A P-51 Mustang aircraft - WZ-S (serial number 44-72218), named "Sweet and Lovely", of the 78th Fighter Group, Duxford. The aircraft was piloted by Lieutenant Thomas V. Thain. Handwritten on slide casing:"WZ-S Dx post VE Thomas V Thain"
Corrected serial number from 44-72218 to 44-72203 and added 84th FS.